Learn fun human body and nutrition facts while playing with this 5-piece set featuring a two-sided interactive chart and game board! 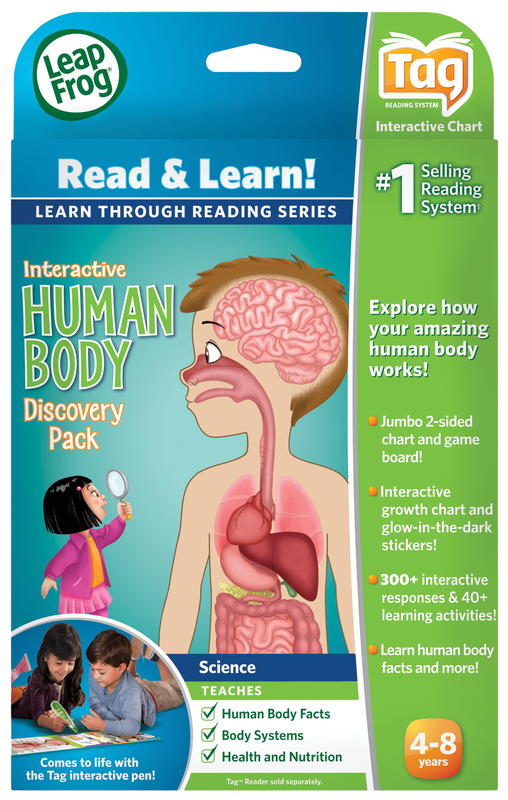 Use the LeapReader Reading and Writing System to bring this human body chart to life! Discover how the human body works and learn to identify its many parts and functions through play and exploration. When kids touch the human body board, their LeapReader talks them through body parts and traits. As young learners begin to understand their bodies, they can be empowered to make healthy choices. Fun songs further inspire kids to take a proactive approach to their health. Dental hygiene becomes fun when they do their two minutes of tooth brushing along with the interactive song, Brush Your Teeth. The Washing Hands song encourages kids to keep their hands clean, and the Move Your Body song emboldens them to get up and move. Parents can connect the device to the online LeapFrog Learning Path to see what their child is playing and learning. Appropriate for children ages 4 to 8 years. For use with the LeapReader and Tag Reader pen only. LeapReader or Tag Reader pen is required and sold separately.